A free service. If the splines on your kicker are damaged, I will be happy to run one of my broaches through it. Pretty good success so far. I tighten the pinch bolt so the broach will just pass through the hole, carefully aligning with the original splines. If the hole has been drilled out or other unsuccessful repairs have been attempted, it won't work. After broaching, you will need to remove the 3 splines on either side of the pinch bolt slot so the pinch bolt will do it's job. Otherwise the kicker slides off the shaft. It's not magic but it allows you to use that old kicker a little while longer. For the lower 48 states, please enclose $30 (will return excess postage) for return shipping and insurance. It doen't take long to do these so a quick turnaround. Email or call first (see my homepage). KICKSTART CRANK SPLINES, please read: Kickstart Crank and G83 Splined Shafts. All OEM Kickstart Cranks, Series A, B, C, D, and Singles,use the same spline configuration and size. All OEM Kickstart Cranks will slide onto all OEM splined shafts. All of my Kickstart Cranks, Series A, B, C, D, and Singles, will slide onto OEM splined shafts. I have come accross 2 newly made splined shafts that do not readily work with my Kickstart Cranks. I can fit the new shafts to my Kickstart Cranks but I would need the shaft in hand. The best thing would be to make sure your new shaft fits an OEM Kickstart Crank, either a spare or a borrowed unit. If it fits, then my new Kickstart Crank will fit, also. Working on Vincents is not for the impatient or the faint of heart. Cadmium plated, Later type. 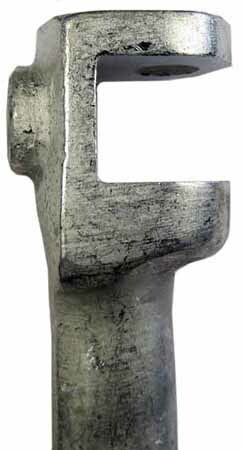 Raised F72/6, foundry mark. Cast 4140 Chromoly steel, not machined stainless. Heat Treated 4140 chromoly to Rockwell 40C. G76-B - KICKSTART CRANK SERIES "B" (Right) CHROME- $500. Lost Wax, cast 4140 Chromoly steel gives great detail and strength. These are properly broached. Shown is my first reproduction part. All are test fitted to my Twin. Heat Treated 4140 chromoly to Rockwell 40C. G76-C - KICKSTART CRANK SERIES "C" (Right) CHROME- $500. Series "C" & "D" Twins. Cadmium plated, Early B type. Raised G77, foundry mark. For the very earliest version, weld end lip (4140 welds easily) and belt sand round. Heat Treated 4140 chromoly to Rockwell 40C. THIS KICKSTART WAS NEVER MADE BY VINCENT. It's a modification of a Burman swivel Kickstart Crank that uses the Twin Footpiece. 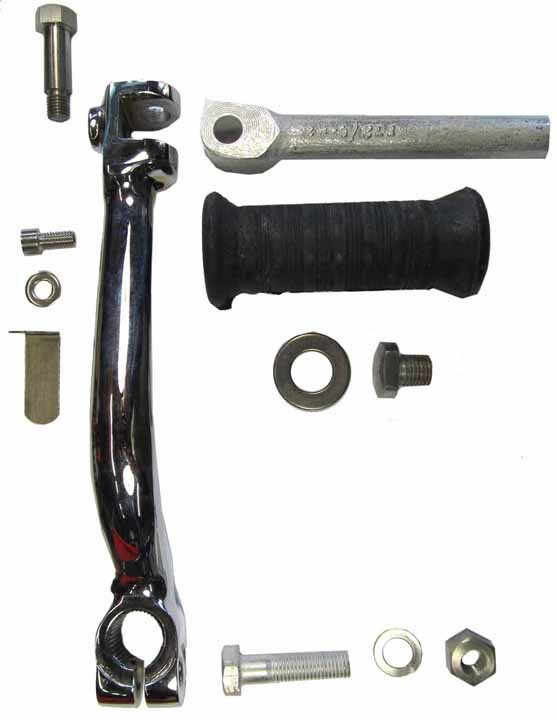 PR50B/1assy - Comet Folding Kickstart Crank Assembly- $397.40 with chromed Kicker Crank and all of the attaching parts. In stock. 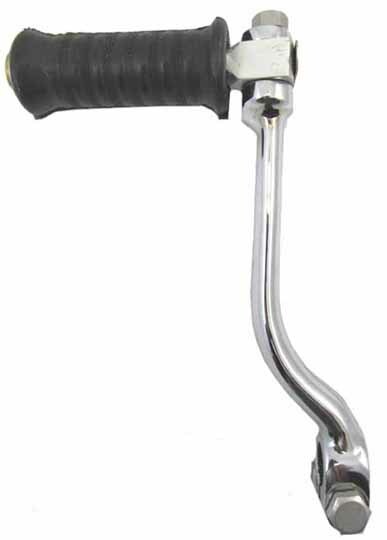 The complete assembly: with chromed Kickstart Crank. F72/6 cadmium plated Footpiece, FT84 bolt, FT99 spring, #92 washer, #662 screw, PR3 rubber, FT202 plug, and 796 washer. 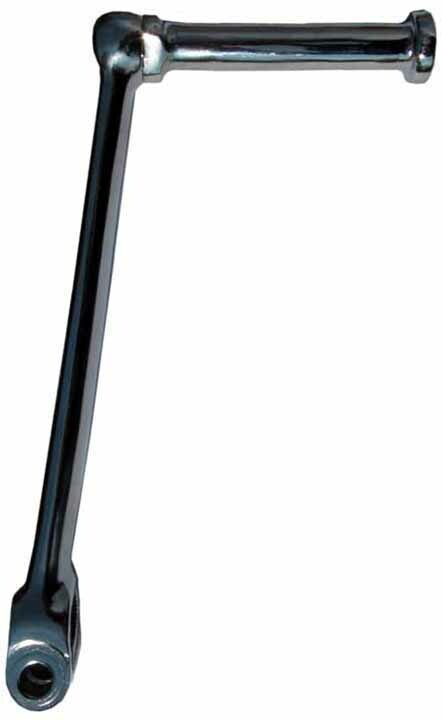 PR50B/1 - Comet Folding Kickstart Crank- $355 chromed with F72/6 cadmium plated Footpiece. In stock. PR50B/1 - Comet Folding Kickstart Crank- $305 cadmium plated finish with cadmium plated F72/6 Footpiece. In stock. Not an exact copy of the Burman swivel type Kickstart Crank but modified to use a cadmium plated F72/6 Twin Footpiece. Much more substantial and will not fail. 4140 chromoly steel, heat treated to Rockwell 40C. PR50-194X - Series "A" TWIN Kickstarter with Footpiece, CHROME. $400 in stock. PR50-194X - Series "A" TWIN Kickstarter with Footpiece, cadmium plated. $340 in stock. Suitable for "A" Singles and some other pre-WW2 bikes with Burman gear boxes. Heat Treated 4140 to Rockwell 40C. PR50-195X-Mark 1 - Series "A" Kickstarter Footpiece. Non-Folding.CHROME. Threaded 9/16" x 20 tpi.